First published in the "Elder's Advisor, The Journal of Elder Law and Post-Retirement Planning." With a few modifications, the estate-planning process could be less prone to conflicts, and a more rewarding and rich experience for everyone involved. Estate planning is a process by which one generation passes wealth to others, usually their adult children. It has become a highly complex and specialized field in which tax and financial experts fine-tune plans to minimize taxes and maximize economic gain. The essence of what is transpiring within the family, however, often gets lost in the process. That essence is a gift from parents to children, or to their children’s children, to charities, and others. Parents who have worked hard and accumulated some measure of wealth are deciding to make their final gift to their children. It is the last note of a family-long song. It is something that could be celebrated but rarely is. It is something that begs to be discussed openly but rarely is. We will discuss why the human side of this extremely important family transition has been so muted that it is barely audible, and how some changes in the estate-planning process could restore it. The problems with the existing methods of estate planning are more serious than just short-circuiting an important family transition. Even though parents spend hours upon hours and thousands of dollars conferring with attorneys and advisors to draw up carefully crafted estate plans, some of these plans simply go awry. Families are torn asunder by allegations, claims, and counterclaims. Litigation drags on for years. Attorneys and other advisors are sued for malpractice. What should be positive family experiences devolve into family horror stories. The horror stories have made many parents afraid of the process. Having worked in this area, and mediated trust and will contests for some years, we have concluded that the nexus of these problems stems from the lack of communication and miscommunication among family members, and between family members and their advisors. Changing the patterns of communication that typically occur during the estate-planning process can make a huge difference in the family’s experience and the advisors’ experience. Parents need encouragement to have serious conversations between themselves and with their adult children about setting estates, dividing property, and their own dying. Most families are going to experience a significant challenge when they try to have these conversations. Many families face a challenge even in their regular, day-to-day communications. People do not typically explain their thinking or describe their feelings particularly well, thereby creating vast room for misperceptions to flourish. People also have trouble listening to one another and make assumptions about what they are hearing. So having serious, open communication about estate matters is usually going to be extremely challenging. Nevertheless, that does not mean these conversations should be avoided. Avoiding the conversations can lead to a host of other problems. For example, in one family we are aware of, a bachelor uncle and an unmarried aunt died within a year of each other, and each left a sizable estate to their nieces and nephews. Neither of them had whispered a word of it to any of their nieces or nephews before they passed away. Months after the aunt and uncle died, all the nieces and nephews received generous checks along with the completed relevant tax forms. Although they were happy to receive their windfall shares in the two estates, most of them reported having an empty feeling as well. The personal element, the “contact” was missing. They wished that they could have thanked their aunt and uncle in person, before they died. They explained that it would have been a very different and much “richer” experience for them than simply receiving the check and tax forms in the mail months later. The conversation that begins, “I want you to know that I’m going to leave some money for you when I die…” is a difficult one for many reasons. It references one’s own death and it raises the subject of money. For many people, these are two taboo subjects. But the responsibility for why these conversations fail to occur rests in part with the culture of estate planning. In this culture, an underlying assumption seems to be that people are better off not discussing their intentions with family members; that doing so might only stir things up, exacerbate problems, or diminish the benefactor’s prerogative to do whatever he or she wishes. Furthermore, if avoiding issues causes problems to arise later among coinheritors, the benefactor will not be bothered with it—now being permanently removed! Most situations in life are not like estate planning in this regard. During our lifetime, we might choose short-term benefits, but there is always the distinct possibility that we will still be around when the longterm consequences come home to roost. When it comes to wills and trusts, people will not be around to face the fallout. The culture of estate planning seems to have taken the fact that benefactors won’t be around and concluded that what happens after their deaths is not their concern. In the best of all worlds, when couples with adult children hire estate planners, they enter the process with a solid, healthy marital relationship. Ideally, they both have access to the same financial information. They have spoken to their adult children, listened to them, and understand their needs and interests. They have communicated to their children what they are generally thinking with regard to their estate. The children accept and can live with their parents’ wishes. When the parents have gathered all this information, had the conversations, and rehashed it all, the two of them are still in sync about what they would generally like to accomplish. That is when they hire their estate planner. The estate planner is then in a perfect position to collect all the relevant information from the couple and go to work. That is the best of all possible worlds. Unfortunately, such a couple is a rarity. The fact that most families are much more complicated than this ideal was less of a problem years ago. Prior to the era of specialization and stringent conflict rules, attorneys who knew their clients and families well created their wills and estate plans. Like family doctors, those attorneys knew all the children and were aware of the families’ trials, tribulations, successes, and failures. In that climate, it was common for attorneys to counsel spouses without discussing the possibility of a conflict of interest. Today, that deep level of familiarity is rare. The legal climate is one in which conflict-of-interest concerns are always a part of the attorneys’ thinking, and family dynamics are typically more complex than in years past. Estate planners, at times, advise couples who do not have solid, healthy relationships. The husbands and wives may not have access to the same financial information, and it is doubtful that they share the same level of understanding about their situation —especially if they are wealthy. It is unlikely they have had open, candid conversations with each other or with their adult children about their own or their children’s needs and interests. The likelihood that such couples are truly in sync with one another is slim. Couples who are not in sync about how they should handle the transfer of their assets if one or both of them dies pose a potentially serious problem for estate planners. Smoothing over, minimizing, denying, or failing to explore possible differences can have disastrous consequences for couples, their families, and their advisors. When couples are only seen together by their planners, they may never express their real thoughts, feelings, wishes, or apprehensions because their only opportunity to speak is in front of their spouses. Estate planning attorneys are not really free to have separate conversations or interviews when they represent couples because of the likelihood of a conflict of interest. In separate sessions they would be more likely to hear divergent views, differences of opinion, and conflicting needs and interests. However, to avoid the potential for a conflict of interest, the attorney would need to advise the clients that the substance of any discussions with either spouse would be shared with the other. This would probably negate the benefit of a separate conference. Suggesting to couples that they both should have their own counsel can actually create problems between spouses where none may have existed. Because these situations inherently have the potential to become adversarial, when spouses obtain separate representation it increases the probability that they will, in fact, become adversaries. If the suggestion is made for separate counsel and the couple declines, they may be asked to sign a “consent to joint representation.” While this may satisfy ethical requirements, it too can foster feelings of being adversaries, stir up suspicions, and even cause one or the other spouse to put off or abort the estate-planning process. In summary, the steps commonly used by estate planners to remedy their concerns regarding conflicts of interest can limit their malpractice exposure, but are unlikely to open up communication or lead to plans that satisfy the needs of spouses and work for all their children as well. Introducing the process of mediation into the estate-planning process gives estate planners a way to handle ethical concerns without sacrificing the clarity that is achieved when one person has separate discussions with each interested party. It also gives estate planners a way to feel confident that the information developed through mediation represents their clients’ real wishes. In the estate-planning process, mediators are uniquely positioned to help planners with the preparatory work of clarifying the real needs and interests of the spouses and adult children, thereby increasing the likelihood that everyone will be comfortable and satisfied with the plan that is developed. The expertise of mediators is in fostering an open, constructive dialogue of difficult subjects, building a collaborative spirit (especially when people feel at odds with one another), and helping people arrive at mutual understandings and consensual agreements. The mediation process is designed to achieve successful resolution of highly emotional and contentious conflicts. It does so in the following way: The mediators are neutral and work for the common good of all the people involved. They may work for the entire family even while recognizing the different roles, authority, and positions of the various family members. In estate planning, this means that they recognize that it is the parents’ prerogative to do whatever they wish with their assets. Mediators also recognize that parents want all their family members to feel as good as possible about their decisions and not feel angry, cheated, or resentful over the final plan. In consultation with parents and their estate planners, mediators decide whom to include in the process. Mediators may bring all the involved adult parties into the process in order to achieve the best possible result, with the greatest buy-in and the least chance of having the final plan contested for any reason. When all the participants are agreed upon, the mediators meet with everyone involved—together and separately—in order to ensure that everyone’s concerns are known and dealt with, that hidden agendas see the light of day, and that the process moves along as swiftly as possible. Mediation is an informal, flexible process that mediators actively direct and guide. The discussions range from emotional, interpersonal dynamics to hard, cold dollars and cents. Mediators do not give advice. While they never tell people what they should do, they do encourage, coax, and motivate people to create consensual agreements that have the greatest potential for working in the long term for everyone involved. It is helpful for mediators to be familiar with the basic principles and terminology of estate planning. They will not give advice about strategies, though. Mediators are likely to consult with the estate planners, but the expert role and all advice given is clearly reserved for the planner. It is also important for mediators to understand family systems. Being skilled at working with individual personalities, personal values, family history, and interpersonal dynamics can help keep sensitive discussions constructive. In many of these situations it is helpful to have two mediators working together, one experienced in estate planning and the other experienced in family systems. The fact that what transpires in mediation cannot be used later if there are adversarial proceedings is a real advantage of mediation. Oral and written communications, admissions, offers, notes, etc., made during mediation cannot be used in later litigation or arbitration, so it is not risky for the parties to be completely open. Most mediators describe the bounds of confidentiality in a mediation agreement, and most jurisdictions provide broad protection to mediation proceedings, including prohibiting the mediator from testifying if there is subsequent litigation. The result is that people involved in mediation tend to be open and candid with the mediators. This is especially true in separate caucus sessions during which they can verbalize their worst fears and suspicions, their angriest feelings, and their wildest ideas about possible resolutions to the problems. People understand that it is part of the mediators’ job to help them sort through what is real and what’s not, and what is productive and what’s not. Mediation is advisable whenever an estate is very large, whenever a potential conflict of interest becomes apparent during the estate-planning process, or whenever family circumstances are particularly complex. In large estates, the potential for conflict is high because of human nature and the pervasiveness of misunderstanding and greed. It is easier to uncover the existence of a family member’s secret plans, desires, and hidden agendas and resolve them before conflicts erupt than it is to get people to sit at the same table and negotiate after an eruption has occurred. If there are no ticking bombs—something that may take a family systems specialist to discern quickly—then the mediation goes very rapidly and the family and the estate planner can proceed with confidence that the plan the advisor designs will truly meet the desires of all the people involved. After mediation, the estate planner also has a record that his or her advice and plan documents correctly address clients’ desires. None of these issues is straightforward. For example, a child who provides years of care for a sick parent may expect a larger share of the estate. A parent may look upon the years of help and see it as balancing the years of special attention that child received earlier in life. A sister may look at the help and see it as precisely what she would have done had her circumstances allowed her to help. The nature of family relations in these types of situations can foster suppressed emotions and many hidden agendas. Poor communication and misconceptions may cause people who love one another to become antagonists. Whenever any of these types of complications exist, it behooves families to have mediators assist them with the discussions. Mediators can help family members and their advisors to find and resolve the hidden issues. This can eliminate the tendency for procrastination or avoidance on the part of one person or another. In this way mediation can expedite the estate-planning process, even as it appears to add another step. We have been discussing the need for mediation in the estate-planning process but it has actually been used more frequently to resolve problems after death during probate and trust administration. Relations between executors or trustees and beneficiaries can turn sour because of divergent priorities, differences on matters of substance, perceptions, or perspectives on family history. Often differences are in perception rather than substance. Mediators help the parties clear up areas of ambiguity and aid them in developing a plan of interaction that promotes all their interests. As a result, executors and trustees no longer dread the beneficiaries’ phone calls, and beneficiaries may feel less need to call the fiduciaries. In situations that involve estate contests or disputes over the administration of wills and trusts, the courts are not charged with working out the best possible solution. Judges are forced to listen to scripted testimony and render decisions, typically for one party and against the other. Their judgments may be cumbersome, with little actual relief to either party. If the goal is a genuine solution rather than a finding of fault, then mediation is a far better approach because achieving a genuine solution requires far more flexible communication and discussion of needs and interests than formal court procedures will allow. Mediation is also desirable in these types of situations for other reasons. First and foremost for many people is that it keeps family matters private. Disputes can be resolved without court involvement and public scrutiny. Because mediated solutions are usually achieved in much less time than those that result from arbitration or litigation, the cost of mediation is typically much less. Because the mediation process is essentially a collaborative one, it is far easier on the relationships among the people involved than adversarial proceedings. In fact, it often has a healing effect on the relationships and individuals. Since all the outcomes from mediation are consensual, family members never have the feeling that an outsider is telling them what to do; they are the ones deciding what is best for them. The following case studies are either situations we know about personally or have worked on. The first two of the four cases illustrate the problems that arise in estate-planning situations when there is insufficient communication among the parents and their adult children. The first one was not a large or complicated estate, but the fallout created a most regrettable family rift. The second case revolves around just one asset and thus, on the surface, looks deceptively simple. The second two cases show how mediation can very meaningfully alter the typical communication patterns. A widowed mother decided to leave all of her estate to her daughter because of a wide disparity in the net worths of her son and daughter. She told neither one of them for fear that the son would be angry. She was right. The son was speechlessly angry when the will was read. He claimed that his anger was a result of the way his mother and sister plotted behind his back. He assumed that his sister talked his mother into the plan. He says that the money was insignificant to him and that he would have been happy for his sister to have their mother’s money if he had just been consulted. Now, years later, he still does not talk to his sister and his memories of his mother remain clouded —tainted by what he discovered after she died. What made the secrecy doubly hard for the son, he says, was that his mother seemed to trust and respect him. She had solicited and received his help with many of her financial decisions in the years prior to her death. It seems apparent that even had the brother not liked his mother’s idea of leaving her money to his sister, or had the mother been encouraged—and perhaps assisted—to converse about her intentions when she drafted her will, the family’s experience would likely have been far healthier than the way it turned out. What was a potential conflict between the mother and son was transposed into an actual conflict between the brother and sister, one that so far has been intractable. A husband and wife who owned a hundred-year-old mansion on the Atlantic coast had every good intention to leave the house to all five of their children so that their children could enjoy it with their own children, just as they had done. Their estate plan included mechanisms for transferring the property in the most tax-advantaged way. One day, the father absent-mindedly leaked their secret to one of their sons who then told a sister. The sister blew up at the mother, telling her in no uncertain terms that she wanted no part in such a housesharing arrangement with her siblings. The parents are currently in the process of considering using mediation to facilitate a more open dialog with their five children and respective spouses so the second plan will have a better chance of working for everyone than the first one did. In this case, a couple did not talk with their adult children in advance of planning their estate, but had their eyes opened accidentally after their plan had been drawn up. Parental decisions about giving their possessions to their children are among the most difficult decisions they have to make, whether it involves dividing up various possessions or not dividing something and having the children share it. Knowing who has emotional attachments to what possessions is extremely difficult. Having conversations about giving property or other objects of worth to various children is not easy, but avoiding the conversations is often a greater problem. The parents in this case—Richard and Judy—had had grown children and wisely recognized that it could be in everyone’s interests to talk together about what they were planning to do with their estate. Because of the conflict-of-interest concerns, their estate attorney recommended that each child have his or her own counsel. For the most part, everybody conferred with his or her own attorneys, accountants, and financial advisors. The experts corresponded among themselves and their proposals were circulated among the family. Everyone understood the concepts being presented. Each attorney spent much time with her or his client, and family members had many conferences —yet the family was not communicating effectively. During the family meetings, Richard and Judy were basically on their own with their children and children’s spouses. Each meeting would begin cordially, but before long someone was yelling. Others would refuse to talk. Weeks and sometimes months would go by before they would attempt another meeting. Some people talked between meetings but rather than help, it only raised the suspicions of others who were not privy to those conversations. As the relationships became increasingly strained, family members suspected one another of conniving to gain advantage. The suspicions grew both within and between generations. It was adversely affecting Richard and Judy’s relationship. It also was causing, or worsening, rifts in two of their children’s marriages. The proposed plans that were circulating had great technical merit with respect to tax minimization, but the lines of communication between and among attorneys and clients (dictated by conflictof- interest rules) did not provide a vehicle for the family members’ real interests to become known to one another and their advisors. Consequently, each professional was working with only a few pieces of a much larger puzzle. They were unable to put the pieces together since each had a different concept of what the final picture should look like. Spouses and siblings had nonmonetary needs that were either obfuscated or couched in terms of dollars. Hours upon hours were spent by different experts trying to shape a plan that would satisfy various family members’ dollar demands. One person or another continually vetoed or sabotaged the plans, causing everyone to view everyone else as irrational. Richard and Judy wanted to give up and threatened to not give anything to their kids. An attorney for one of the children suggested that the family engage a lawyer and psychologist mediator team. After clarifying exactly what their role would be vis à vis all the other professionals, the mediators set up a two-and-a-half-day retreat for the entire family, including spouses and the one fiancé. During the first afternoon and evening, the mediators met with Richard and Judy together and separately, and likewise with their children and spouses. The next morning they started by meeting with the entire family together. At that meeting, the mediators’ role was discussed and the family agreed on ground rules for the retreat. Each person had an opportunity to speak without interruption about what he or she hoped could be achieved and his or her own vision for how it could happen. A master list of all the issues was started on flipcharts. Subsequently, there were individual and subgroup meetings as well as more meetings with everyone. The list of issues grew at the same time issues were being negotiated. There were numerous issues that were total surprises to some of the family members. One of the hidden agendas unearthed involved the family business run by Richard with considerable help from his youngest son, Bob. Richard wanted to recognize Bob’s contribution by giving the enterprise to him. What he never knew was that Bob hated the business and wanted no part of it. Bob was afraid to tell his father because of the great sentimental value he perceived that his father attached to it. The business was taking too much of Bob’s time, to the detriment of his own business and his relations with his wife and children. What Richard told the mediators in a separate session was that he was continuing the business only because he believed Bob loved it and would want to inherit it. He had lost his emotional ties to the business. The dynamics of the family were such that this one issue seemed to touch all of them in an inexplicable way. When the mediators brought everyone together and facilitated a discussion of the business between Richard and Bob, everyone first held their breaths, and then released a sigh of relief. Some of the other issues that were negotiated included: What would happen to a summer cottage that some of the children were extremely attached to and others felt no attachment to? How would Richard and Judy deal with certain valuable items that one or the other of them had promised to certain children? and How they would account for considerable money that had been given or loaned to some of the children over the years? The number of family members and advisors in this case created a complex situation—however, any estate with a closely owned business poses a significant challenge to the planner. Such cases always involve tough decisions on many people’s parts about their lives, their careers, and whether or not they see themselves staying with the business for years to come. It is critical in these situations to explore the expectations of various family members. It is also important to explore the expectations of spouses. (There are instances when children’s spouses have even higher expectations than the children themselves do.) Control and succession in a family business are issues waiting to explode if not properly addressed early on. As this case illustrates, until these issues become transparent, they can derail estate planning. This family was wealthier than most, but they were similar to other families in an important way. Although reluctant to admit it, most families have secrets, some emotionally charged bits of information that not everyone is privy to or even aware of. It is that nature of the secrets and histories that make families unique. A major advantage of mediation and the skill of experienced mediators is uncovering critical secrets in families. Mike and Nancy had been telling their adult children for some time that they were going to be planning their estate. The estate’s major asset was a 150- employee mechanical contracting company that they had founded in Connecticut forty years earlier. The eldest son, John, who was president of the company, suggested to them that he and the four other children who were actively involved in the business should work together to devise a plan for how they would divide ownership of the company and run the business. Mike and Nancy agreed to put their estate planning on hold until they’d had a chance to talk with their two children who were not part of the business, and the five of them who were in the business had had an opportunity to formulate a plan. The parents conferred numerous times with their other two children to ensure that there was no possibility that either of them had any interest in being part of the business. They made it clear to them that they would inherit other assets if they elected not to be part of the business. The children in the business hired a lawyer and psychologist mediator team to lead a two-and-ahalf- day retreat in which they created a Family Business Charter, a twenty-five-page document that spelled out in detail all aspects of how they would own and run the company together. Over the course of the retreat, they discussed their personal values, their very different personal styles, and the implications that their different values and styles had for working effectively together. They looked at the management of the company and how they would each have very different roles to play. They talked about the fact that John was president and doing a good job, but that they would create a board to evaluate his performance and replace him if his performance did not meet certain specified standards. They made tough decisions about ownership, not only for their generation but also for the generation after them. They examined their expectations of themselves and one another, and engaged in scenario planning. All of these things, as well as others, went into the Charter, which then went to Mike and Nancy. When they approved it, the Charter was sent to their estate-planning attorney, who relied on the document to help draft the larger plan for the parents’ entire estate. In many families with businesses, the most significant asset is the business. Advising parents to divide that asset equally among the children and give it to them over a period of years may create serious problems for siblings long after the parents have died. When parents look at their adult children and see them getting along, it rarely occurs to them that they are the cement that holds their children together. Time and again, when one or both parents die, the cement weakens and differences that were latent for decades begin rising to the surface. The consequences are frequently siblings who co-own businesses but rarely talk, siblings who supposedly work together but in reality work in parallel, and siblings who end up fighting over who will buy out whom and for what price. Using mediation in this preventative manner to negotiate issues that are as complex as owning and managing a business was a bold and creative step for them. Rather than Mike and Nancy deciding on their own what their children were and were not capable of, they put the matter squarely in the hands of the children, where it belonged. After all, it was their children who would eventually have to prove to the world—not just to them—that they could do it. Engaging adult children in the estate-planning process has real advantages, whether it is done informally with private discussions or with the assistance of mediators. First, talking about this family transition openly with adult children is a respectful thing to do. When children are very little there are no expectations about consulting with them or keeping them informed about major decisions, even those that directly affect them. But as children grow, parents slowly and gradually bring their children into the loop of family decision- making. Teenagers often struggle with parents because they want to be consulted on everything and make all the decisions as well. Parents are wise to keep teenagers informed, consult with them as the situation and their maturity permit, but retain decisionmaking authority as they see fit. When children truly reach adulthood (i.e., not a chronological set point but a stage determined by their level of maturity), they are ready for—and genuinely desire—a new type of relationship with their parents. They wish to be loved, trusted, and respected. Parents can, and often do, demonstrate their respect for them by consulting with them and keeping them informed about decisions and choices in their lives. When parents engage their adult children in discussions about how they are contemplating passing their assets on to their children (and to their children’s children), it creates an environment of respect. Second, because the decisions that parents make about their estates affect their children so directly, it is very helpful for adult children to know what they might expect. Estate planning is often looked at as something that parents should do on their own, but it is really a family transition and one that affects children in many ways. There are many things that parents do in their lives that primarily affect themselves, and have little direct effect on their children. Estate planning is interesting and unique because it is the opposite of that. In many ways it is one of the few things parents do that actually affects their children more than themselves. It is important to recognize that involving adult children in some way in the estate planning process does not imply that the parents are turning over the process to the children; they are simply bringing them into it. Turning over the process, or surrendering control of the outcome, would be as large a mistake as keeping it a secret. Neither extreme is helpful to adult children. Exactly how they are brought in depends on many factors, including the assets, the children, and the expected longevity of the parents. Talking openly with adult children about estate planning greatly lessens the probability of conflicts developing among the children after the parents have died. It accomplishes this in various ways. First, it establishes a precedent of coming together and talking. With this precedent set, people are more likely to talk if they have a problem rather than hire an advocate to talk for them. Also, when people are brought into the process, they have a better understanding of how decisions are being made. Finally, people have a tendency to go along with decisions when they have been involved in the process—even when they do not particularly like the outcome. Adult children appreciate being included, and that can go a long way toward assuaging hurt feelings. Bringing adult children into the planning process can actually bring about pleasant surprises. The mother in Case #1 might have heard her son concur with her wish that her daughter should receive her money. She then could have discarded her wellgrounded fear that her son would be angry with her and his sister. Parents who operate in secret often feel compelled to divide their estate equally, believing that it is the only equitable path. Equal is not always what is truly equitable, but this can be hard for parents to realize—especially parents who have a tendency to deny or minimize individual differences and “treat everyone the same.” Adult children are much better than their parents at recognizing and accepting the differences among themselves. When adult children with disparate economic resources learn of their parents’ estate decisions after the fact, they sometimes wish it had been done differently—that their parents had done more to recognize the differences among them. Once estates are divided, however, things rarely change voluntarily. Talking openly during the planning process can produce pleasant surprises, such as parents and siblings acknowledging and addressing these differences in constructive and creative ways. Estate planning is part of a very important, and often emotionally charged, transition in the life of a family—the death of one generation and the transfer of one generation’s accumulated wealth to others. A great deal is often at stake—emotionally as well as financially. 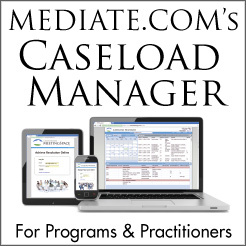 Mediation can be a useful adjunct in the estateplanning process. Because so much is potentially at risk, and because the problems that develop are so frequently related to communication (misperceptions, hidden agendas, etc. ), it makes sense to have mediators help parents explore their intentions and the potential consequences of their intentions before the actual planning work begins. Sometimes mediators engage adult children directly in the mediation process with the parents. Attorneys whose clients have the benefit of mediation will have more confidence that their clients are truly of one mind about their intentions. The nature of the mediation process helps ensure that the result will be equitable, realistic, and acceptable to the key parties. Consequently, the planner’s risk of malpractice claims will be reduced. The practice of using mediation to resolve will and trust disputes is in its adolescence. The practice of using mediation during estate planning—before any disputes arise—is in its infancy. During the past decade trial lawyers have come to recognize how mediation can provide a better outcome for their clients. Now estate, business, and tax planners can also utilize professional mediators to enhance the scope and quality of their services and their relationships with their clients. Estate planners have an opportunity to help estate-planning mediation develop in a manner that is most useful to clients and professionals. Dialogue between estate planners and mediators, as well as continuing education seminars focusing on mediation in estate planning, should be a high priority. Of course, mediation is a useful vehicle for resolving will and trust contests and disputes among heirs and between heirs and personal representatives. But it is much better to nip these problems in the bud—during the planning stage— before they have the chance to damage important relationships.